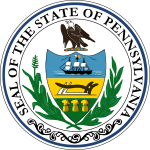 The 1948 United States presidential election in Pennsylvania took place on November 2, 1948. Voters chose thirty-five representatives, or electors to the Electoral College, who voted for president and vice president. Pennsylvania voted for the Republican nominee, New York Governor Thomas E. Dewey, over the Democratic nominee, President Harry Truman. Dewey won Pennsylvania by a margin of 4.01 percent. As of the 2016 presidential election[update], this is the last time that a Democrat won the national election without carrying Pennsylvania, and until 2016 the last time when a Democrat lead in the nationwide popular vote without carrying Pennsylvania. It was also the last time until 1968 that any presidential candidate won the election without carrying the state. ^ David Leip. "1948 Presidential General Election Results – Pennsylvania". Dave Leip’s U.S. Election Atlas. Retrieved 2018-03-24. This page was last edited on 14 December 2018, at 17:21 (UTC).